Japan is not like most other Asian countries, in fact, it’s about as different as you can get. Bargaining is not common and it certainly isn’t as cheap as most of the South East Asian countries Kiwi’s love to frequent. 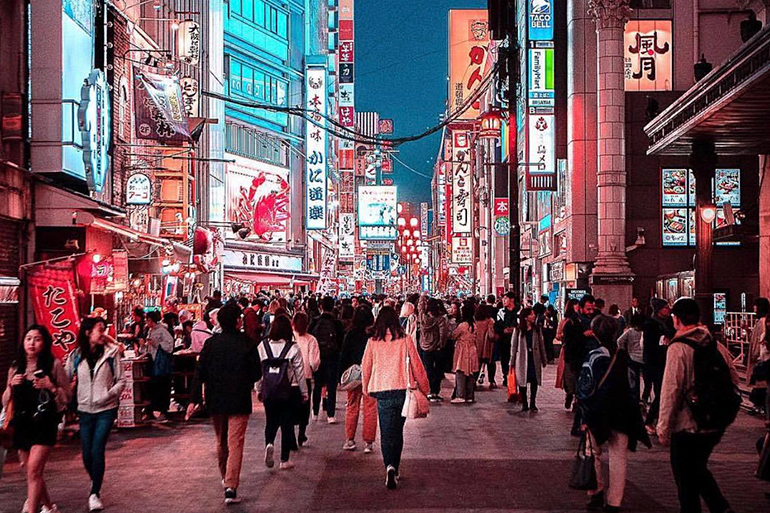 However Japan is emerging as a new popular holiday destination with the cost of flights reducing dramatically over the last couple of years, now is the perfect time to go whether you’re looking to ‘treat yo’ self’ the whole way or count your pennies so you can go further and see more. We’ve got you covered. Food glorious food! There are so so many options when it comes to eating delicious food in Tokyo whether you’re looking to make it rain Wagyu or scraping the BBQ with Okonomiyaki. There are more Michelin star restaurant than you can poke a chopstick at (Tokyo has more than any other city in the world), and plenty of cheap and delicious street eats like Takoyaki (doughy octopus balls). Japan also has the freshest sashimi you’ve ever tried, especially from Tokyo’s Tsukiji Fish Market. Japan has food to fit every budget and it’s worth trying a little from each. Since you’ll be in the city that holds the world record for the most Michelin star restaurants, why not treat yourself to a dining experience like no other (when in Rome...or rather Toyko right)? Tokyo currently lays claim to 13 three-star restaurants, 52 two-star and 165 one-star establishments, 29 of which are brand new, so the choice is yours. For a three star experience don’t go past Japanese restaurant Kanda, famed sushi restaurant Sukiyabashi Jiro Honten, or French restaurants Quintessence and Joël Robuchon. Or if you’re feeling brave, try Japanese restaurant Yamadaya which specializes in the potentially poisonous Fugu (pufferfish), sliced with expert precision. 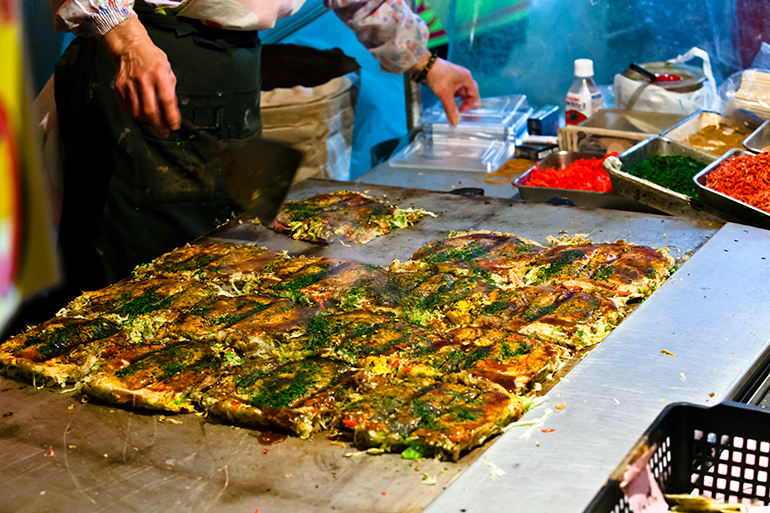 To save the dollarydoos for other activities you can find street eats like Okonomiyaki (a cabbage-based Japanese omelette), Ramen, Yakitori (BBQ chicken skewers) and Yakisoba (fried noodles) inexpensively pretty much everywhere. Other yummy cheap treats to try include green tea ice cream, mochi balls and Yatsuhashi (both made from rice flour). There are a few things to remember when drinking in Japan, number one is to never pour a drink for yourself, this must be done by a friend or your host and the same goes for you remembering to pour your companion’s drink. And number two is to make sure you have fun when yelling “kanpai”, which is "cheers" in Japanese. “For relaxing times, make it Suntory time!” - For fans of Sofia Coppola’s Lost In Translation, head for the same hotel that Bill Murray’s character Bob Harris stays in, the Park Hyatt Tokyo and have a drink at the featured jazz bar. Drinks are a bit more exxy and after 7pm there’s a cover charge but it’s well worth it for the live jazz entertainment and Tokyo city views. Drinking in Japan is certainly not as cheap as most other asian countries, the average beer will set you back about NZD$7.70 (600 yen) which isn’t too bad but to really save your yen and drink on the cheap, it’s best to drink on the street. You heard right, a huge selection of chu-hai (alcopops made with shochu, a barley, sweet potato or rice distilled spirit) are available at convenience stores and in vending machines which are legal to drink in public and are about NZD$1.40 (100 Yen). Alternatively head to an izakaya (the equivalent of a Japanese pub) for a nomihodai deal aka all-you-can-drink for a couple of hours for about NZD $25-38 (2000-3000 yen). Where do you begin when trying to describe all of the incredible activities and sites to both splurge and save your money on when in Japan. From ancient temples and shrines to karaoke rooms, tea ceremonies and of course the shopping! There’s so much choice, in fact almost too much. Hands down one of the best experiences to have in Japan is to see it through the eyes of a local which is why single day tours with a local guide are absolutely worth every yen. I’d recommend the Urban Adventures’ Tokyo After 5 tour. Each day tour adventure lasts about 4-5 hours and is lead by an English speaking local who will show you the hidden laneway eateries and explain interesting facts about the history and culture of everything from Shintoism to the creation of Monjayaki . Tours start at around NZD$100 and are well worth the price tag. There are so many temples and shrines in Tokyo and many of them are either free or require only a small entrance fee or donation. They’re the absolute glimmering beacons of the city and you can’t visit Tokyo without seeing at least one. If you only make it to one temple while visiting, then make it the Sensoji Temple. It is a Buddhist temple with a history that stretches back over 1300 years. It also lays claim to hosting Japan's oldest shopping street, Nakamise-dori. This street will guide you to the temple where you can pick up a traditional snacks or wooden ornamental gift along the way. We recommend a 60/40 split, with 60% of your currency in cash form with a few different denominations. Safeguard the rest of your spending money on a Cash Passport Platinum. A card is the best way to make those large purchases, but just be careful your money isn’t funnelling through a tight sieve. When exchanging your Kiwi dollars to Japanese Yen, some banks charge a flat fee, commission, a bad exchange rate, or all of the above. These fees aren’t always so transparent either, so make sure you do your research and know exactly where your money’s going. 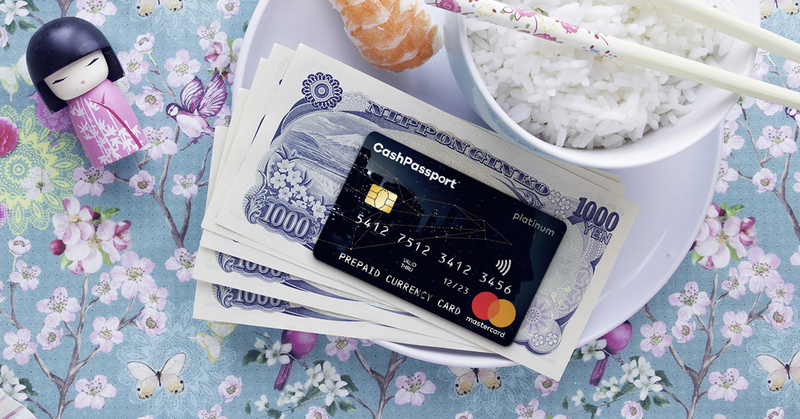 The Cash Passport Platinum allows you to lock in your exchange rate the day you load^, load up to 10 currencies on the card and it's valid for 5 years. Is your go-to in most situations in Japan (and Southeast Asia). ATMs are actually a little difficult to seekout , and are barely in existence in more regional cities like Kyoto and Osaka. Many places, like street stalls, won’t accept the card in your wallet – that means no mochi balls for little Ben unless you’ve got cash. Make sure you add Rate Guard to your JPY purchase in store. It's free, and if the rate improves within 14 days of purchase Travel Money NZ will refund you the difference*. Keen on more travel tips and information on making the most of your Yen in Japan? Visit your closest store and chat to one of our foreign currency experts. This blog is provided for information only and does not take into consideration your objectives, financial situation or needs. You should consider whether the information and suggestions contained in any blog entry are appropriate for you, having regard to your own objectives, financial situation and needs. While we take reasonable care in providing the blog, we give no warranties or representations that it is complete or accurate, or is appropriate for you. We are not liable for any loss caused, whether due to negligence or otherwise, arising from use of, or reliance on, the information and/or suggestions contained in this blog. ^The exchange rates set out in this website apply to reload transactions that are booked on this website only and that are settled within four hours. Subsequent card reloads will be processed at the then prevailing exchange rate on the day of the reload transaction, and will be locked in at that rate. You will be notified of the exchange rate applicable before you confirm your transaction using a particular reload method. When you book a transaction and load NZD or a foreign currency directly onto your card, you will receive the exchange rate notified to you in the "Today's Exchange Rate for Direct Currency Loads" table. Where you conduct a purse to purse transfer and transfer funds already loaded on your card into another currency, you will receive a different exchange rate than when loading funds directly onto your card. You will be notified of the applicable exchange rate before you confirm your purse to purse transaction which may be less favourable than the rate displayed in the "Today's exchange rate for Direct Currency Loads" table. We will provide you with settlement instructions at the time you book a reload transaction. Different exchange rates will apply to card loads and reload transactions in our partner locations or to reload transactions that are conducted directly via Bank Transfer or Bill Payment (i.e. without booking an online transaction). For more information on how we set exchange rates please see the Terms and Conditions. Sam Aldenton is a travel writer, digital content creator (read: takes photos/videos with her iPhone and sometimes a real camera) and former retail and youth trend forecaster. When she's not off discovering the world’s best pizza (an obsession picked up from her 4-years in New York), she makes her home in Brisbane, Australia. Follow her on Twitter or Instagram at @samaaldenton.